The MGS300 System is a fully integrated and certified continuous emissions monitoring system (CEMS) based on high resolution FTIR technology. It is designed to monitor emissions from stationary sources such as waste incinerators, power plants and cement kilns and is able to directly measure the composition of hot, wet and corrosive sample streams without the need for sample conditioning. Key to the system design is the MultiGas™ 2030 CEM-Cert FTIR analyzer, which is able to monitor multiple gas constituents over a wide range of gas mixtures. Its high resolution (0.5 cm-1) enables the monitoring of these components with minimal cross interference effects from water (up to 40%) or other potentially interfering elements. Also, the MultiGas' permanently stored, internal calibration spectra eliminates the need for costly calibration gas mixtures. 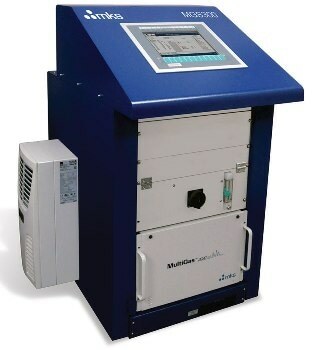 MGS300 is an extractive Continuous Emissions Monitoring (CEM) system incorporating a MultiGas™ 2030 FTIR analyzer along with a number of performance-critical sampling components, including a sample probe (with integral filters), a heated line and an eductor pump. MultiGas™ gas cell and sampling instruments operate at elevated temperatures to prevent the condensation of sample species. The materials used in their construction (wetted parts) have been carefully selected to ensure that sample integrity is fully maintained and that no selective absorption or desorption of gas components occurs under normal monitoring conditions. An automated control platform monitors and regulates all system parameters and continually logs conditions in an event list. Gas composition data is externally available from either a series of 4-20 mA analog outputs or an optional data transmission interface (DTI).